Its unique rocky landscapes and vast wildernesses have always lured travelers to the American Southwest. The region is home to a third of our national parks and its towns and cities brim with character and cultural richness. These family-friendly destinations belong on your vacation short list. With its spectacular landscapes, warm climate, Navajo heritage, and numerous kid-friendly resorts, Arizona offers so many great things to do on family trips. 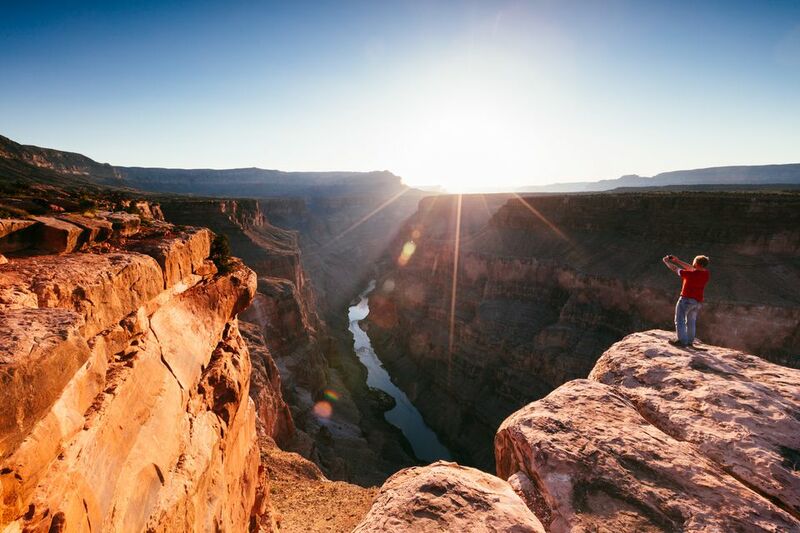 Rent an RV to explore the Southwest's iconic national parks, following the “Grand Circle Tour” developed by the Union Pacific Railroad in the early 1920s. The second most-visited of all American national parks, Grand Canyon National Park belongs on every family's bucket list. Don't miss ranger-led programs that offer families an opportunity to explore and learn about the park. Junior Ranger programs for kids ages 4 to 14 include self-guided activities and ranger-led programs. Looking for a fun, relaxing family vacation on water? Consider a houseboat rental on Lake Mead, which, much like its neighbor Las Vegas, is artificial. Formed as part of the Hoover Dam project, this 112-mile body of water is unnaturally set in the desert. The area known as the Valley of the Sun encompasses Phoenix, Scottsdale, Tempe, and at least a dozen other smaller cities. Best known for its tony resorts, Scottsdale offers families a wide array of museums, shops, restaurants, and lots of ways to have fun. As the lowest, hottest, driest place in the United States, Death Valley is more forgiving in the winter than in the summer, when temperatures routinely exceed 120 degrees. Running north-south off the coast of mainland Texas, Padre Island is the world's longest barrier island and a playground for beachgoers and sun lovers. Aside from the town of South Padre Island on its southern end, the island is quite sparsely populated. The central portion of the island is preserved in a natural state as the Padre Island National Seashore. North Padre is where you'll find the pristine, unencumbered Texas coast—a dramatic contrast to the often congested scene of South Padre. If you're contemplating a family road trip that takes in multiple national parks, there is arguably no better place in the United States to set your sights than Utah. The southern half of the state is home to the so-called "Mighty 5"—a remarkable quintet made up of Arches, Zion, Bryce Canyon, Canyonlands, and Capitol Reef. Together, they deliver an unrivaled opportunity for a getaway that delivers not only spectacular scenery but as much hiking, biking, whitewater rafting, and stargazing as your troops can handle. Fossil Rim Wildlife Center offers a 9.5-mile scenic drive-through safari experience offering close encounters with dozens of exotic animal species and there's also an animal center with a petting zoo. You can even spend the night in the Fossil Rim Lodge. Like the beach? Galveston is a pretty, prosperous town on a Texas barrier island in the Gulf of Mexico known for its beautiful historic district, families fried shrimp, beaches (including seven miles of new beach), and myriad family fun attractions. Oklahoma's breakout destination is Oklahoma City, which expanded its Olympic training site in 2016 to create a massive aquatic adventure mecca for families. With its top-notch zoo and history center, OKC offers families plenty to do and see. Though this is a thoroughly modern city, its historic roots are very much evident in attractions such as the must-see National Cowboy & Western Heritage Museum and the Oklahoma History Center. If you happen to visit during mid-June, be sure to check out Red Earth, the largest Native American festival in the world. An hour and a quarter north of Santa Fe, Taos has been marching to its own drummer for decades, with a unique mix of Anglo, Hispanic and Native cultures, and art galleries on every lane. Home of the YouTube water-slide sensation known as the Royal Flush, Waco offers a lot of fun for families. Other highlights include the city's Riverwalk, a seven-mile walkway that runs along both sides the Brazos River; the Cameron Park Zoo and Mayborn Museum Complex. What Are Florida's Most Popular Vacation Destinations?